The following Demo illustrates our Forex prediction software’s ability to predict exchange rates between multiple currencies at a given point in time. For the purposes of this demo, weekly historical data of exchange rates were obtained from the Monetary Association of Singapore (MAS), spanning across January 1998 to April 2015. While our software typically runs real-time predictions, this demo will only be using historical references. Please note that the results for this demonstration only compares SGD vs USD. Please visit the link mentioned at the bottom of the page to access the demo. You will be greeted to a welcome page which looks like the image below. Select a preferred “Year” and the “Month” from the respective dropdown menu (excluding April 2015, being the last record in our database) and click on “View Graphic”. A graph will be displayed with the corresponding “SGD vs USD” values across the 4 weeks of the selected month, its associated minimum and maximum prediction values, our prediction (black line) and the real value (blue line). To obtain further information, scroll down and select a specific “Week” from the dropdown menu and click “Make Prediction”. 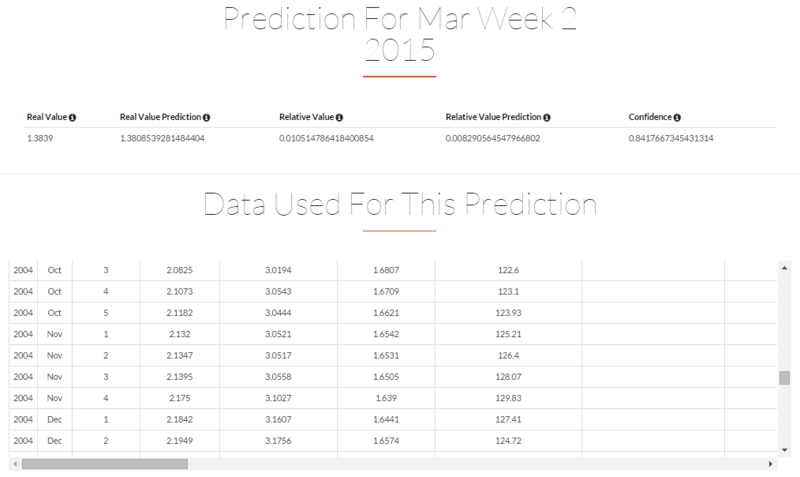 The real value and our prediction value will be displayed with the associated confidence level and the data set used to make this prediction.